Most of us arrived at the retreat on Thursday, some driving 16 hours to get there! We almost lost Jane and Vanessa in a series of road closures, but they made it. Whew! 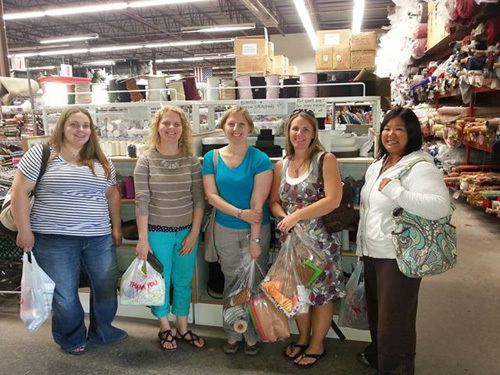 On Friday we headed up to SR Harris Fabric Outlet in Brooklyn Park. Their building is 30,000 square feet of fabric goodness. If you are in the Twin Cities area and haven’t been there, plan to spend the better part of the day shopping. Really. The pictures on their website are just a hint of what’s there. Be prepared to cut your own fabrics (and put away the bolts you’ve pulled!) because the staff only cuts if you need 5 yards or more. If you have questions, ask an employee or even another shopper. After all, fabric shoppers tend to be kindred spirits and quite willing to share their knowledge. Some of the girls after shopping at SR Harris. From left: Sarah, Vanessa, Jeri, Steph, and Jane. This photo also shows a small corner of the front of the store. Thanks to Michelle for the picture! We were a little worried about maxing out the suitcase weight (and space capacity!) of some of the mamas who flew in, so some of the goodies traveled home via USPS. Flat rate boxes are fantastic! I’ve added a scale to my list of things to bring to our next retreat so we can judge suitcases better and keep them under the airline limits. This is a medium flat rate box. It weighed over 14lbs and had 36 yards of woven fabrics/quilter’s cottons in it. Tons of wonderful in that box!